The Victorian women’s team secured a 5-1 victory over defending champions Western Australia to win the Australian Women’s Interstate Teams Matches at Royal Hobart Golf Club. It was the first outright win for Victoria since 1996 with Su Hyun Oh and Julienne Soo finishing the series undefeated for the Victorians. Each State was represented by six players who contested singles match play in a round robin format, concluding with last Friday’s final. Western Australia in recent times have dominated the Interstate Series, winning the last two occasions. All expectations were on another Western Australian victory, yet the talented Victorian team of Jo Charlton, Grace Lennon, Bianca Ling, Su Hyun Oh, Tilly Poulsen and Julienne Soo secured the teams first victory since 2010, where Victoria finish joint winners with Queensland. 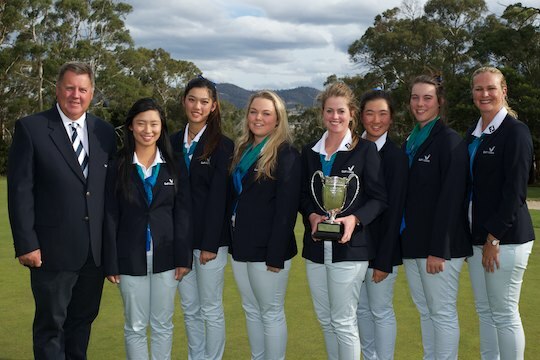 Friday’s final produced some interesting results with Oh defeating Australian Amateur champion Minjee Lee, 4&3. Grace Lennon, playing number 2 for Victoria was too strong for Hannah Green winning their contest 6&4, while Soo beat Hayley Bettencourt 3&2. Jo Charlton playing number 4 for Victoria won easily with a 7&6 victory Nicha Thanissorn, with Blanca Ling at number 6 for Victoria winning 2&1 over Alyssa Keir. Claudia Pisano secured Western Australia’s only match with a 5&4 win over Tilly Poulson. Queensland finished in third place after beating New South Wales 4-2 at the first consolation final. In the second consolation final, the Tasmanian women’s team recorded their first victory of the week with a 4-2 win over South Australia.